To get a FREE Obis One Black Garlic Sample, just sign up for their mailing list by entering your email on the left side of the page. Look for "Request a Free Sample" to get the form. Obis One is a family-owned and operated specialty food company located in Salem County, NJ at Obisquahassit (circa 1670), New Jersey’s oldest working farm and Salem County’s oldest residence. 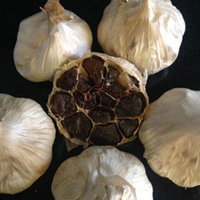 Our flagship product is organic black garlic. Our products are all 100% made by us, without any additives or preservatives, in our USA.